Другие требования: Для первичной активации необходимо Интернет-соединение; для сетевой игры требуется вход в Games For Windows — Live и Rockstar Games Social Club (для регистрации вам должно быть не менее 13 лет); требуется наличие/установка ПО: Adobe Flash, DirectX, Microsoft .NET Framework 3.0, Games For Windows — LIVE и Internet Explorer. Grand Theft Auto IV Complete Edition GTA 4(Steam)RU/CIS 289 р.
GTA: Grand Theft Auto IV (STEAM GIFT / RU/CIS) 349 р.
GTA: Grand Theft Auto IV - Complete Edition (3 in 1) 349 р. Grand Theft Auto IV: Complete Ed. (Steam KEY) + ПОДАРОК 355 р. Grand Theft Auto IV 4 steam gift (RU+UA+CIS) 368 р.
GTA: Grand Theft Auto IV (STEAM KEY / ROW) 369 р. Grand Theft Auto IV (Steam GIFT RU/CIS) Tradable 379 р. Grand Theft Auto IV 4 (Steam Gift ROW / Region Free) 399 р. Grand Theft Auto IV (STEAM GIFT RU/CIS) 429 р.
GTA: Grand Theft Auto IV - Complete Edition (3 in 1) 449 р. Grand Theft Auto IV (Steam Gift/ROW) 450 р. Grand Theft Auto IV - GTA 4 |Steam Gift| РОССИЯ 495 р. 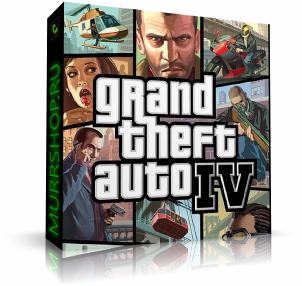 Grand Theft Auto IV (Steam Gift | RU-CIS) 499 р. Grand Theft Auto IV: Complete Edition (steam cd-key RU) 499 р. Grand Theft Auto IV (ROW) STEAM Gift GTA 4 Region Free 499 р. Grand Theft Auto IV (Steam Gift | RU) 510 р. Grand Theft Auto IV (steam key) -- RU 528 р. Grand Theft Auto IV (Steam key) @ RU 537 р. Grand Theft Auto IV ( Steam Gift | RU+KZ ) 539 р. Grand Theft Auto IV (Steam Gift ROW / Region Free) 550 р. Grand Theft Auto IV Complete Edition (Steam/Россия) 559 р. Grand Theft Auto IV Complete Edition steam gift RU+CIS 575 р. Grand Theft Auto IV Complete Edition (ROW) - STEAM Gift 599 р. Grand Theft Auto IV + GTA: San Andreas (Steam Gift ROW) 599 р. Grand Theft Auto IV The Complete Edition (steam) -- RU 791 р. Grand Theft Auto IV: Complete Edition (Steam Gift) 799 р. Grand Theft Auto IV: The Complete Edition (Steam) @ RU 805 р. Grand Theft Auto IV: Complete Edition ( Steam key ROW) 955 р. Grand Theft Auto IV (Steam | Region Free) 985 р. Grand Theft Auto V & Grand Theft Auto IV(Gift RU+CIS) 1 199 р. Grand Theft Auto IV: Complete Edition (Steam | Region Free) 1 235 р.